The life of the professional snowboarder, skier or surfer sounds pretty amazing, right? Riding powder in exotic locations, boat trips to far-flung oceans—empty lineups and trackless mountains. But where does real life fit into the dream? As action sports athletes get older, having a family is just a natural progression of the human experience. But how, exactly, do babies, boardbags, and airport check-ins all fit together? Is there room for a small child on the cramped seat in the heli? Does breastfeeding sound plausible as you’re hiking up the skin trail on a film mission? Welcome to our new series, Parenthood, where we hear from professional actions sports athletes who are navigating careers while raising young ones. 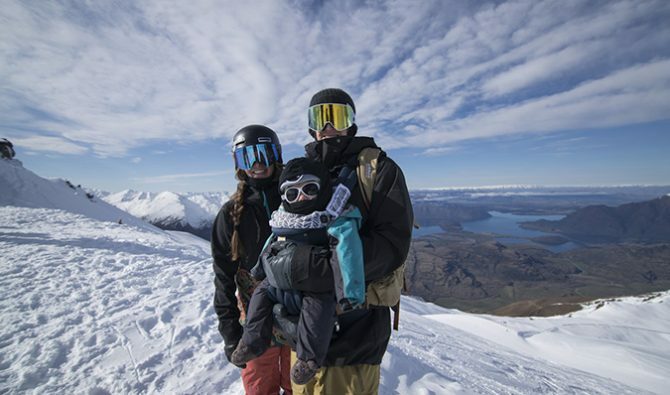 This week professional skier Chris Benchetler and snowboarder Kimmy Fasani join us to talk about raising their young son, Koa. Kimmy was at the top of her game when she decided to have a child with Chris last year, and she has no intentions of giving up her career. “So many men in our world are able to pick and choose the trips they go on to work with raising their kids,” she told me. “I just want the same standard to apply to women.” What Kimmy and Chris had to say was pretty revealing. The season before I won Transworld’s (2017) Rider of the Year award was one of the best seasons of my career. I was able to combine progression with big mountain riding and felt like I had hit my stride with filming video parts. But during that time my mother was diagnosed with a really aggressive cancer. She was my only source left. My dad had died when I was younger. The last thing she said to me (before she passed) was, “now, you go and have babies.” I realized after spending all this energy focused on my career, I wanted to have a family. I didn’t know how long it was going to take, I just wondered what we were waiting for? We’d been married for five years at that point and been together since we were teenagers. We decided to give it a go and I got pregnant a lot quicker than expected. You’re naïve before you have a child. You don’t know how much it will affect your life. I wanted to balance my career and having a family, like I see so many men in my industry do. But I knew it was going to be uncharted territory. I knew that I had what it took and was at the top of my game: becoming pregnant put a spin on everything. I’m excited to see where this leads me. There hasn’t been anybody in snowboarding that’s wanted to take their career past having a child. Koa is off to a good start. Mine is going to look a little different now but there’s a lot that’s not going to change. I’m still going to be in the mountains and snowboarding. All my sponsors have chosen to stand by me. None of them know what that looks like. I don’t know how to come up with a specific job description for what I’m about to do. That’s the beauty of it. Sponsors have trusted me through the ups and downs of my career and allowed me to create my own niche in backcountry freeride snowboarding. They trust that I’ll be able to continue what I do and be authentic. That, more than anything, is most valuable. I’m going down a new road but I’m not the only woman who’s ever done it in action sports. So many amazing athletes have had children and maintained their positions. Lyndsey Pastrana in skating and Bethany Hamilton in surfing are some of my heroes. But snowboarding is a totally different balance. You’re really out there. My child has to be with someone I trust completely. I can’t catch a wave and come back in. You’re deep in the mountains. Chris (Benchetler) and I are both pro athletes and neither one of us is just able to stop doing what we’re doing. We both have to be fully committed to raising our child and balancing our careers. The handoff will come into play but we’ll also have someone travel with us as well so we can both have quality time out in the mountains. I’ve been able to mitigate so much risk and fear management throughout my career. I try to stay present and evaluate. Sure, having a child is a whole different type of responsibility but I’ve always been a calculated rider. I’ve never thrown myself off something without thinking it through. I feel like I’ll have the same mindset, now. I feel like it’s definitely a bit easier for professional male athletes having a child by virtue of nature. I always previously thought the idea that women are expected to hang up the career was dated, but now seeing Kimmy with Koa, he won’t take a bottle, he needs her all the time, etc. It’s so much effort for her to keep the same lifestyle. That will change, but right now the mother is his life source. Before, I thought that perspective was just some people’s ideas of women, however, I’m now understanding nature a bit more. Yes, it’s challenging, but she’s killing it and it’s totally doable. And it’s obviously helpful if you have a partner so you can continually help each other. I think I have such a different dynamic from Kimmy being the mother. Historically the industry felt kind of anti-mother, and from an outside perspective, it’s seemed like mothers were pushed out and expected to be done with their career. So coming into that mentality, she had different waters to navigate. I honestly didn’t receive any pushback from my sponsors, and thankfully neither did she. The work-life balance is achievable. I guess I expected to feel quite a bit different after Koa was born as far as taking risks out there, but if I’m being completely truthful, I already had a good head on my shoulders when it came to risk. I don’t thrive on super dangerous, exposed lines in the mountains. I’m more focused on the flow and the creative side of skiing. There’s always the risk of avalanches, but I never wanted to die before I had a child, so I’ll just continue down that path of trying to make good decisions in the mountains, and doing something I truly love. Honestly, its hard to know for sure, but I think this might be easier if I was a competitive athlete. I stopped competing when I was 16 to film with Poorboyz and continued on the film path ever since. Being a film athlete and chasing storms you have to keep evolving with the outdoor industry in general. You fail a lot. There was the birth of the internet. An influx of content that saturated the market, etc… as a film skier you don’t generally get to ski a lot–less and less the more films I’ve made because of weather, variable conditions, and navigating new creative video ideas, etc. When I was a competitive athlete, I rode park a lot and focused on trick progression. The time spent actually skiing is exponentially more than I have now as a film athlete. It’s much more scheduled with competition. With that said, babies and children need a routine—they need a nap and to eat on time. And we have no routine when you’re focused on filming because you rely so much on Mother Nature. We’re trying to bring Koa into our life but there’s definitely times we are both overwhelmed and think, “is all this effort really worth it?” I think the answer will always be yes, but at times having a child makes it extra challenging.